The last 111kms of the French Way is one of the most popular Camino routes for people planning their first Camino trip. We have designed an informative and entertaining audio guide for all pilgrims hoping to learn a little more about the last section of the French Way, also known as the Camino Frances. As one of the most famous routes, featured in many films and books, this trail will allow you to feel the spirit of the Camino. 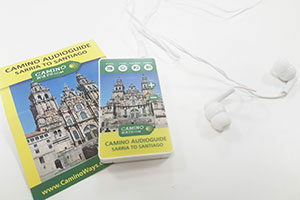 This practical Camino audio guide was designed, written and developed so that you can get to know a little bit about the route ahead of your journey each day. It is broken up by days and will give you an account of what to expect along the way. From the type of terrain to the attractions you may stumble upon, our expert travel team have put their experience and knowledge into this useful guide for all to enjoy. 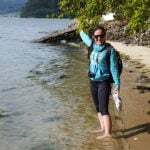 The Camino travel specialists provide useful tips on what to see and where to stop at each stage of this journey. We cover the level of difficulty on the trail, helpful travel tips, directions, distance and the tasty dishes to try out. Galician native Juanma will help you with pronunciation of the local Galician language and give you some insider information for some of the days walking. The audio guides are available for anyone walking the last section of the Camino Frances from Sarria to Santiago. You can add it to your booking itinerary or request more details about the guide with our travel team. For more information about the Camino Frances or any of our walking and cycling tours please contact one of our travel specialists. by How do i get the guide? What do I need to do to get the guide?